Every year, a group called the Foundation for Environmental Education awards “Blue Flag” status to the cleanest beaches in Europe and beyond. 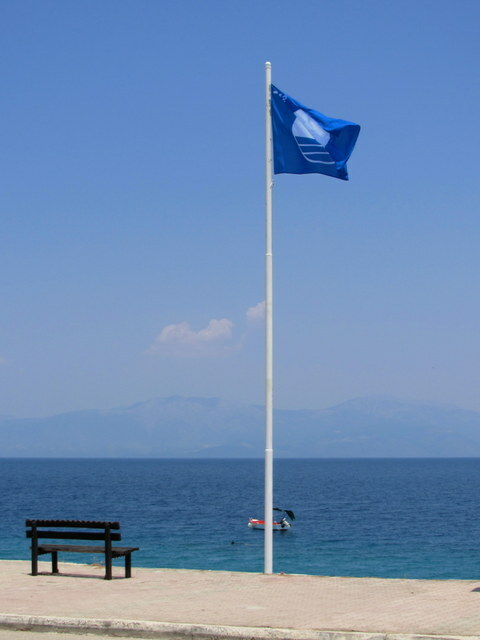 Each year since we’ve been here, the beach at Sikya has enjoyed Blue Flag status — until last year. We don’t know the issue but this beach and our neighboring beach in Melissi didn’t make the list. We were happy to see that both beaches were reinstated this year. The award status runs from July 1 to June 30, and on Thursday the flag was hoisted again over the beach. Had this been our first year here, we might have wondered why the responsible official waited until the 5th to raise the flag. With the benefit of 5 years experience, however, we just laughed. This entry was posted in Kolpos Korinthiakos. Bookmark the permalink.